Due to a double-booking, this event will now be on at the Colonel Fawcett, 1 Randolph Street, London, NW1 0SS. It is 2 mins walks from Camden Road overground or 10 mins from Camden Town Tube. 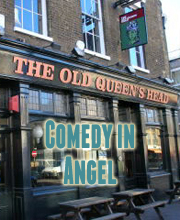 It was previously billed as being on at the Old Queens Head in Angel. Tickets are still valid. Email laughoutlondon@hotmail.co.uk if you need more info and for details on refunds if you can no longer make it. Laugh Out London in Angel is delighted to welcome back BRIDGET CHRISTIE, deserving winner of Best Show at the Foster’s Edinburgh Comedy Awards 2013 and NICK HELM, star of the excellent BBC sitcom Uncle and multiple Edinburgh Comedy Awards nominee. Tickets are £5.50 (inc booking fee) in advance, or £6 on the door. Fresh from starring in the critically acclaimed sitcom Uncle and from his nomination for Best Show at the Fosters Edinburgh Comedy Awards 2013 (he was pipped to the post by Bridget) Nick Helm comes to The Old Queen’s Head. Nick is currently preparing for his new TV show ‘Nick Helm’s Heavy Entertainment’ after its successful pilot for the BBC and is one of British comedy’s fastest rising stars who must be experienced live. A youngster of already established talent and brilliance. After only eight months of performing Ivo was awarded the acclaimed So You Think You’re Funny 2009 New Act Award at the Edinburgh Fringe, nominated for Chortle Best Newcomer Award before being chosen to perform at the Montreal Just For Laughs Festival. “The intelligence and maturity of Ivo Graham is remarkable” **** – Three Weeks. Nick Mohammed is one of the most exciting character comedians on the circuit who is fast becoming a television regular having appeared on Life’s Too Short, Miranda and 10 O’clock Live. He has also appeared in multiple Radio 4 projects and won plenty of praise for his live shows. Charming Australian Bec Hill has established herself as one of the most fun and inventive acts on the circuit. She runs the amazingly fun Pun Run gigs and has been named one of TimeOut’s funniest comedians on Twitter.